Hello there, young learners! 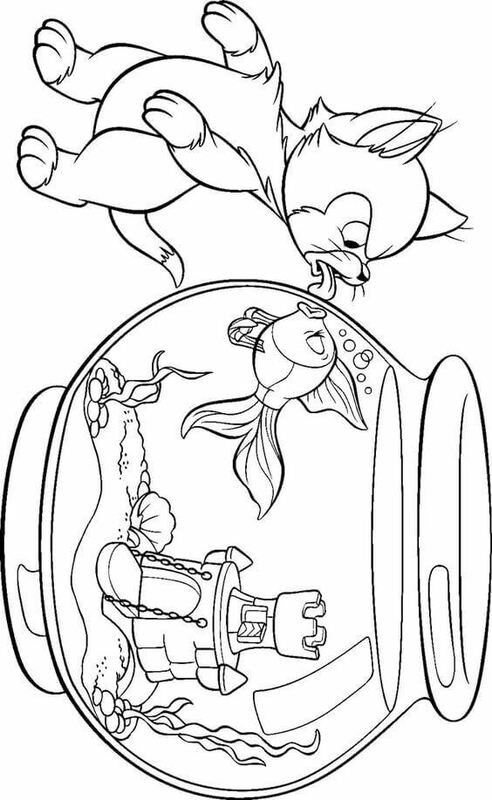 This series of free printable coloring pages showcases the overload of cuteness in its PURR-fect form! Pets are like family members, so we are about to see the princesses of many families that will eventually grow up to behave like queens. Let’s say hello to KITTENS! The young one of a cat is called a kitten. Being a social creature, it enjoys the company of new creatures in the surroundings. This is the perfect stage in their life to introduce them your pets belonging to other species. Otherwise, the grown-up cats prefer solitary time more appealing and are aggressive towards other species. 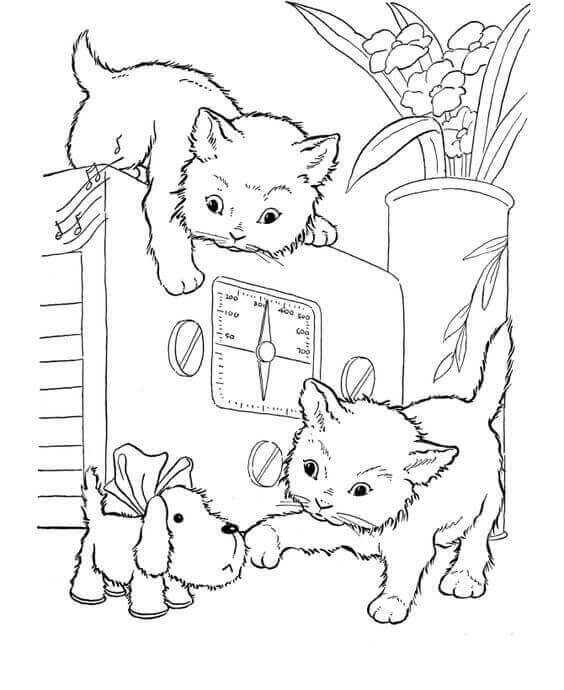 So color these cute being with our free printable kitten coloring pages. 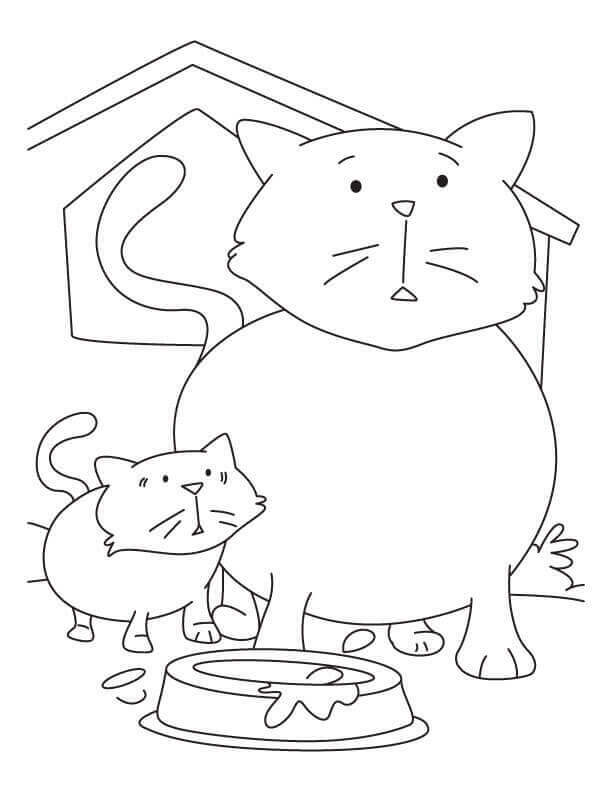 We’re sure you won’t find these kitty coloring pages anywhere else. So check out! 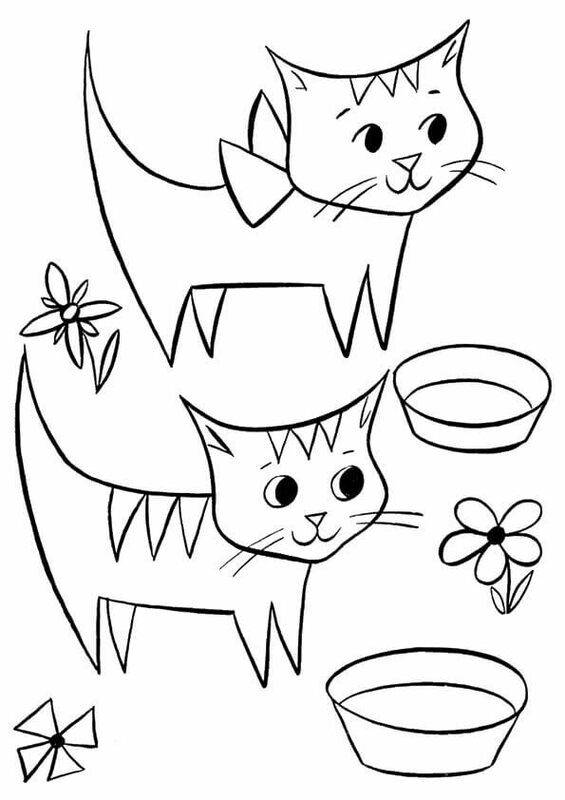 Fish and small birds are the favorite meals of cats. 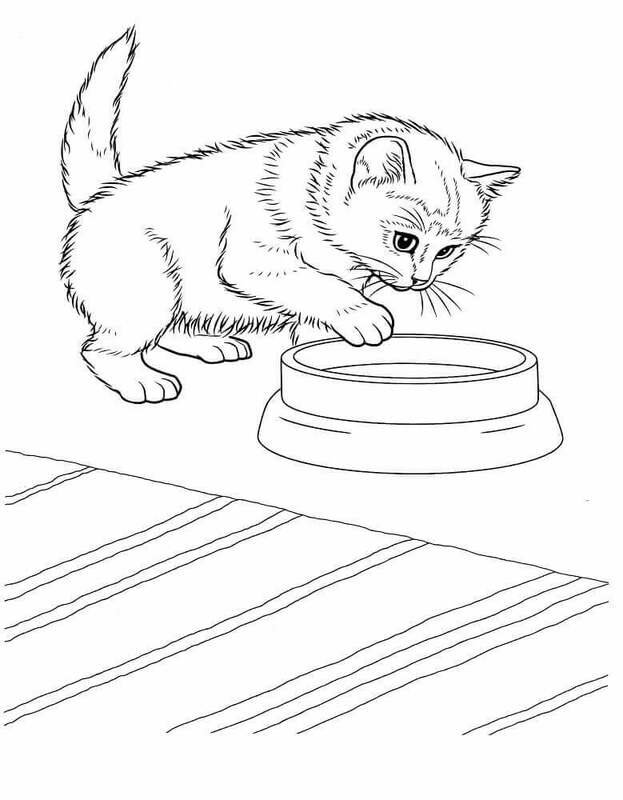 But kitten cannot consume solid food until the age of four weeks. Here, Timmy, the angry kitten is trying to scare away Goldie, the goldfish who is probably coming to kiss him. He doesn’t want to get wet. 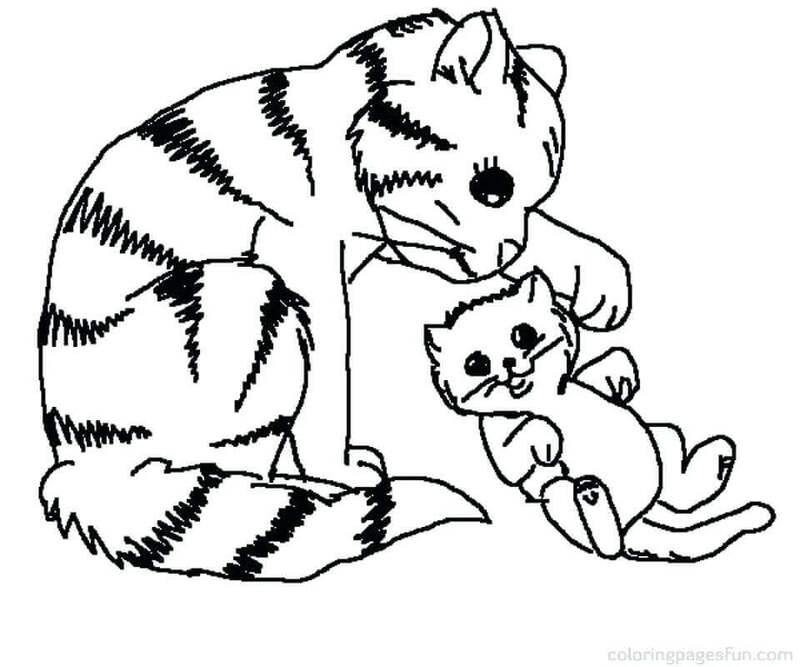 Color them cute! This is Lucy. She is very eager to meet you as you can see; she is staring right at you. Do you want to be her friend? 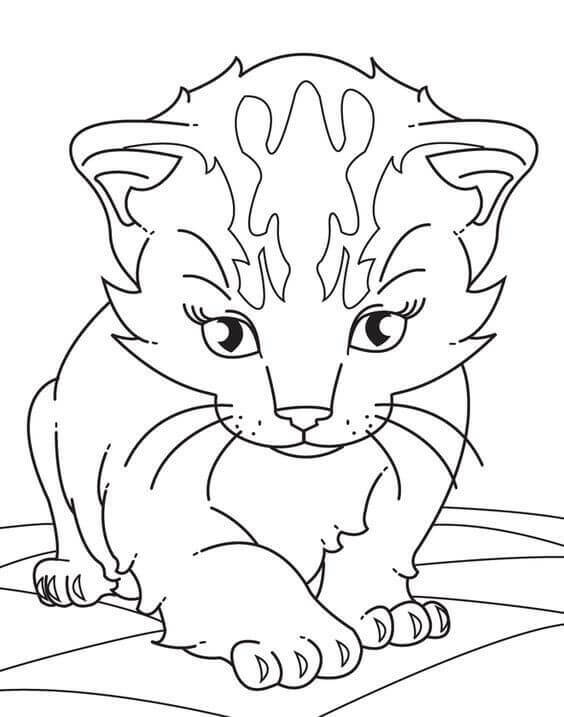 She, like all the other members of Felidae family, is highly social and enjoys the human companion. She’ll surely enjoy in your company too. 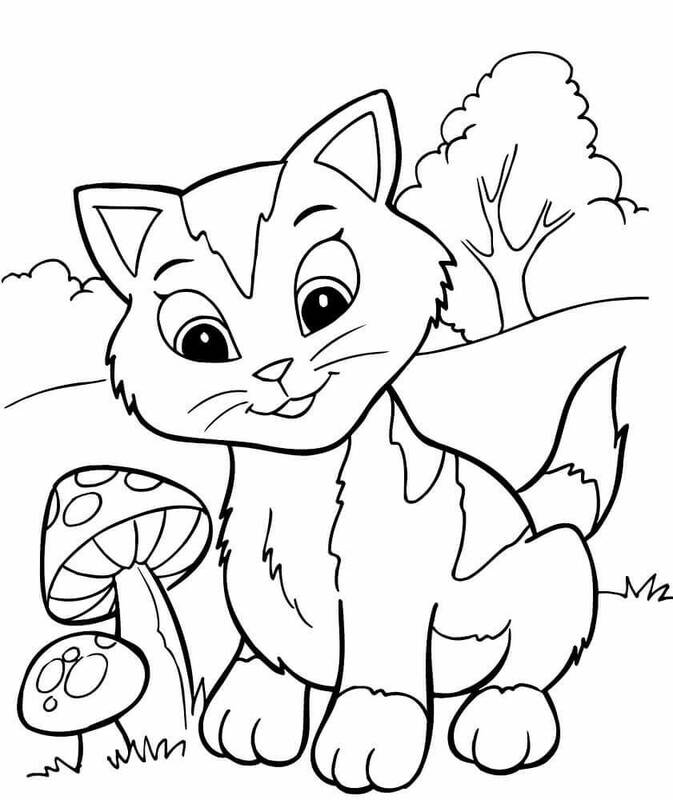 Just like you, kittens are also enthusiastic, and they always love to play. 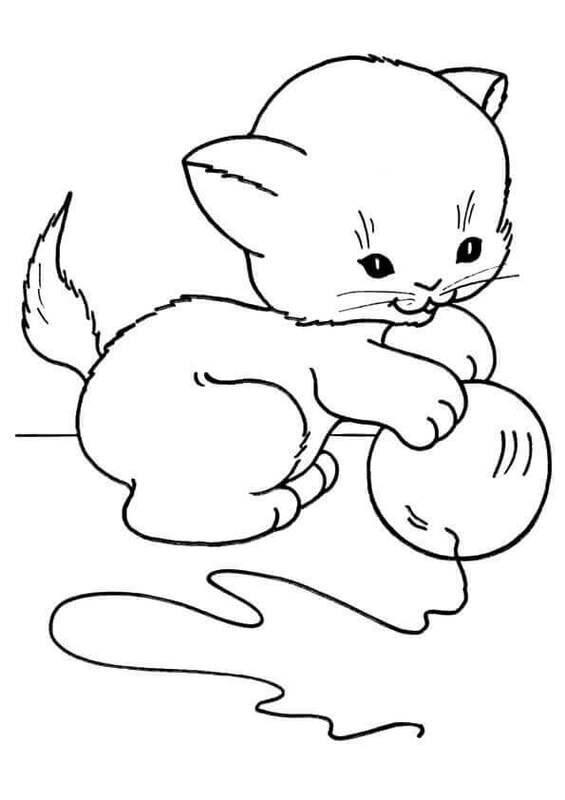 Here, this little kitten is playing with a wool ball, her favorite toy, under the supervision of her mother. Like any other mother, she is concerned about her young one. This little kitty named Millie is very happy that her dad who is playing with her. She is elated because finally, he got some time to play with her. He is very proud of her young Millie. Let’s color their happiness with euphoric shades! Justin and his mother here are waiting for food. Although they got their food on time, they just want more, and that’s why they have this look on their face. Justin is a growing kitten who needs more food to become like his dad – big, strong and fierce. Don’t we all love Christmas? This adorable little kitty loves it as well and is in a Christmas mood. She has two tiny bells tied to her tail which just makes her look even cuter. 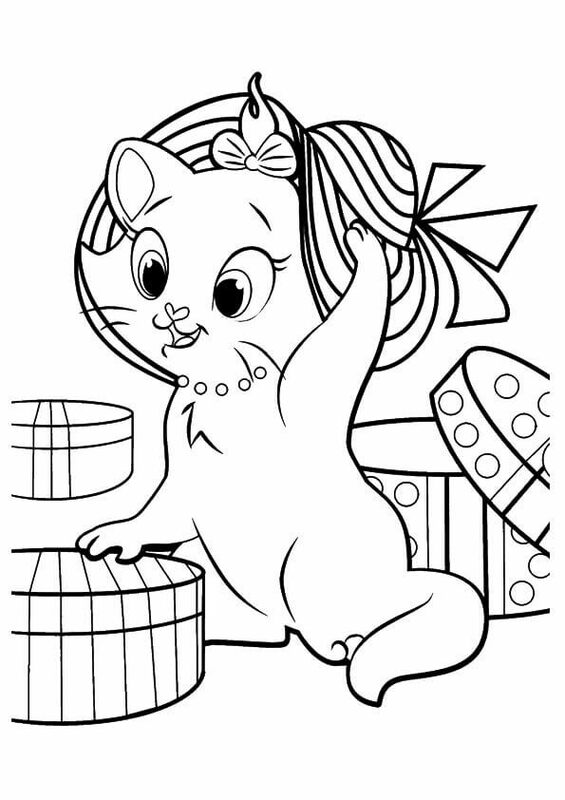 Color this page to make her Christmas more enjoyable. As we all know cats are very social and can strike a friendship with almost everyone. 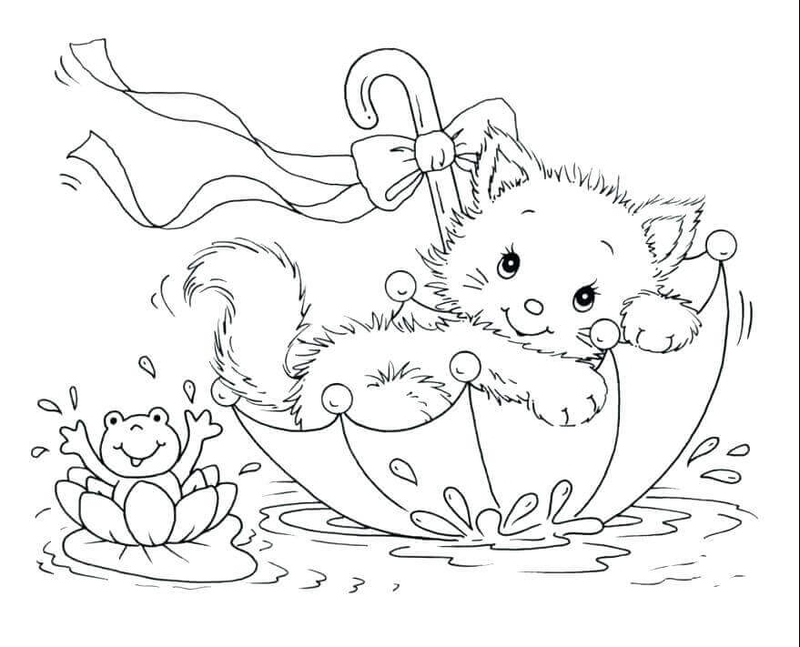 This cute little kitten, sitting in an umbrella is enjoying with her new pal Froggo who is as happy as this kitten. Little Johnny has named his kitten Jon (yes after his name) because he loves him very much. He is feeding Jon which signifies how much he loves his kitten. They were playing with a toy mouse right before Jon’s milk time. Milk is essential for health; not just Jon’s health but for yours too. We all know Marie. She believes herself to be quite the little lady and so tries to imitate the elegance of her mother, Duchess. She is trying a hat to look elegant and like a cat of a Duchess. 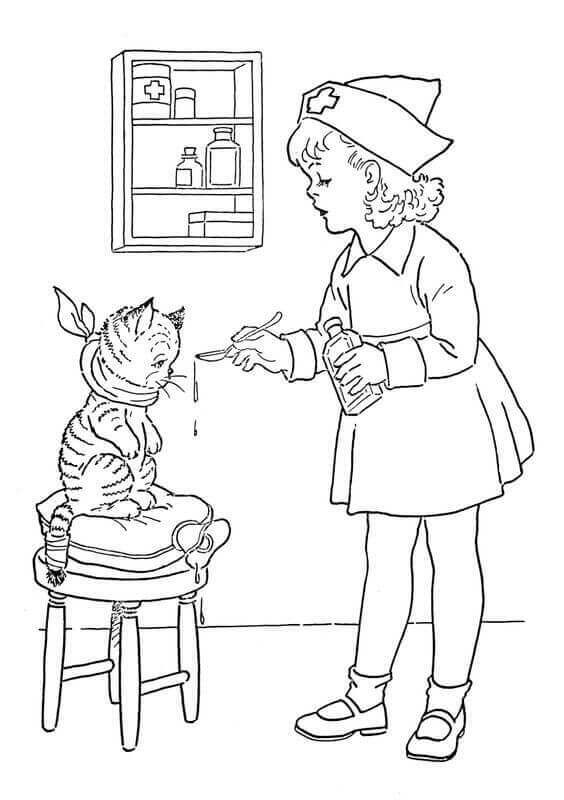 Color her to make her look just like she wants to. This is Bella who is waiting for her meal, but finds her food bowl empty. She is exhausted and starving after all the shenanigans she was up to. She has been running around the backyard since morning and now is waiting for her meal. Kittens can be funny and adorable. 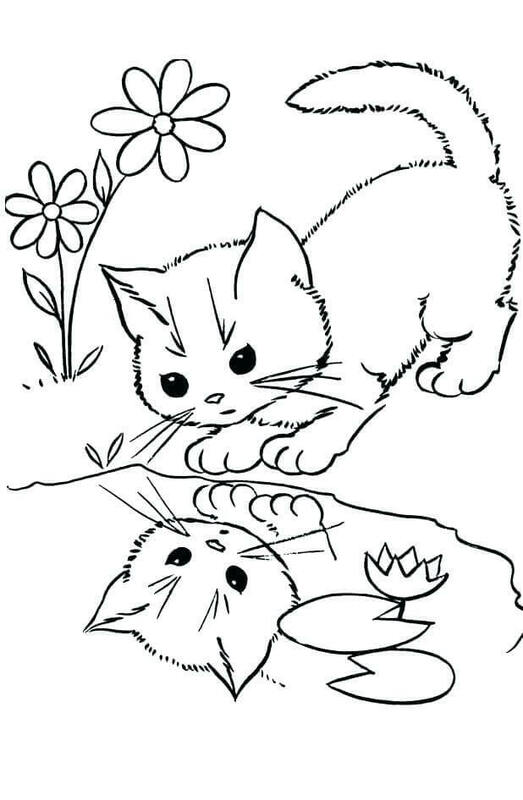 Sam is near a puddle for the first time and is puzzled to see his lookalike, unaware of the fact that it is just his own reflection. This makes him furious, but still, he looks so cute. Do you think he will jump to fight with his lookalike? Kittens spend most of their time walking, wandering, interacting with other things or animals, or playing on their own. Missy here, while wandering in the backyard of her house, has come across few mushrooms that intrigue her a lot. She awestruck just by looking at them. 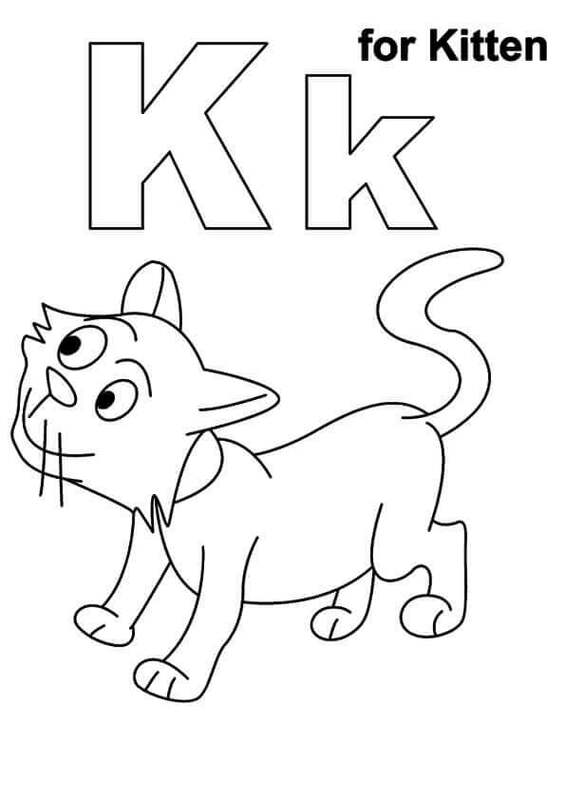 Just like C is for Cat, K is for Kitten. Kittens are juvenile cats who totally depend on their mothers for survival because they can’t see or hear fully until 2-3 weeks old. A cat reaches full “adulthood” around one year of age. A capital “K” is written by drawing one vertical line down the lines of the page with a slanting line going towards the middle of the vertical line and another slanting line going from the middle towards the outside. 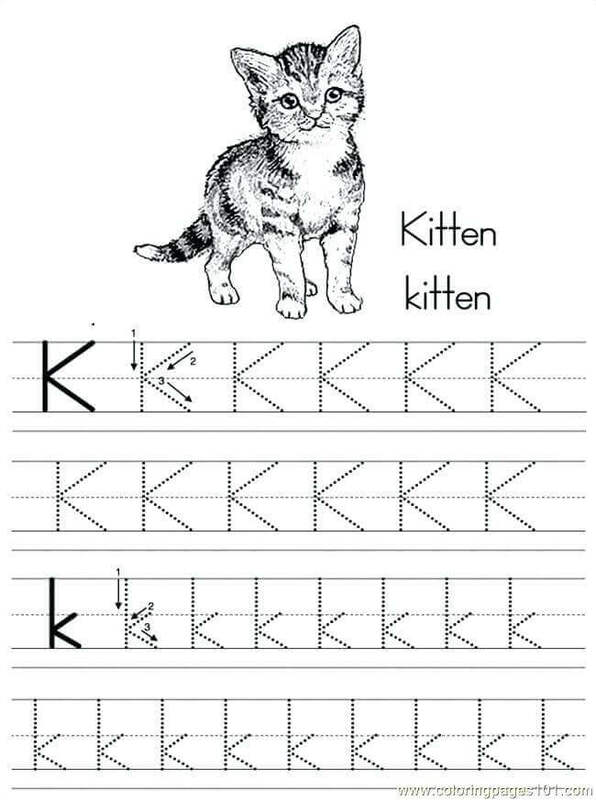 While a small “k” is written in the same way but the slanting lines are shorter than the vertical line. Simple isn’t it? I’m sure you all must have heard the story of Sleeping Beauty. Albeit there are different versions of it, all these have in their core the belief that the princess was gorgeous. 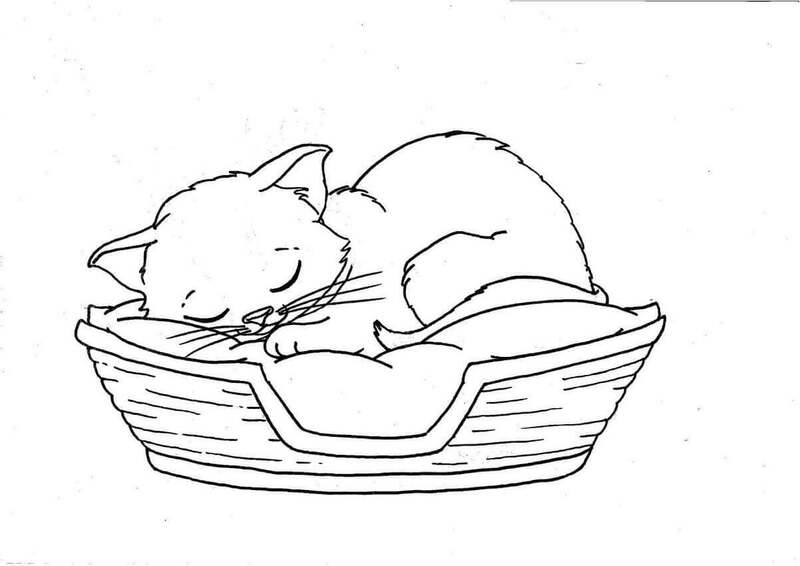 Isn’t this little kitty also a magnificent sleeper? This is Will who by looks is the most handsome kitten out of all his siblings, but also the most notorious. He wandered off the room to go into the garden where he discovered a flower bed that his master had planted a few weeks back. He has this sly look on his face clearly indicating that he is up to something, some new mischief or trouble. 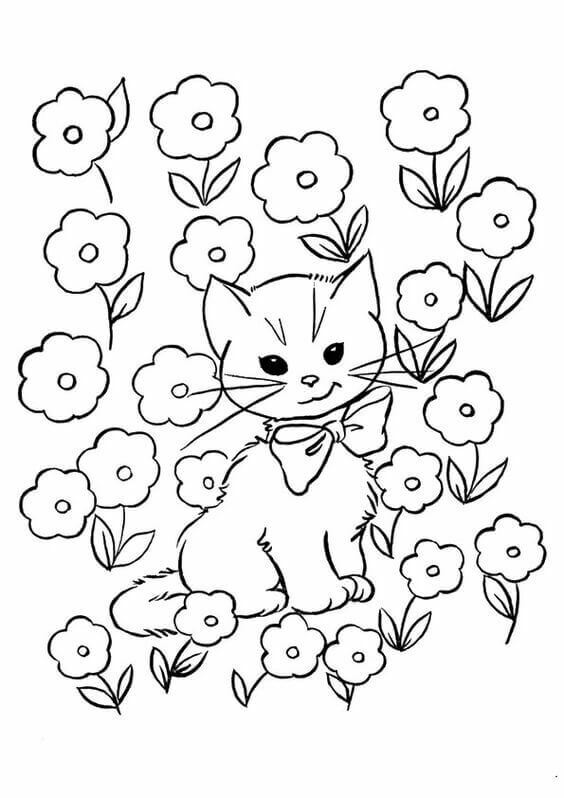 Color this with radiant shades to accentuate the features of handsome Will and the beautiful flower bed. Kittens conserve their energy by sleeping for an average of 18 hours a day. This gives them plenty of energy for growing strong and quickly into adults. Even more intriguing is the fact that a certain growth hormone is released only during sleep, which is why they should rest to grow. 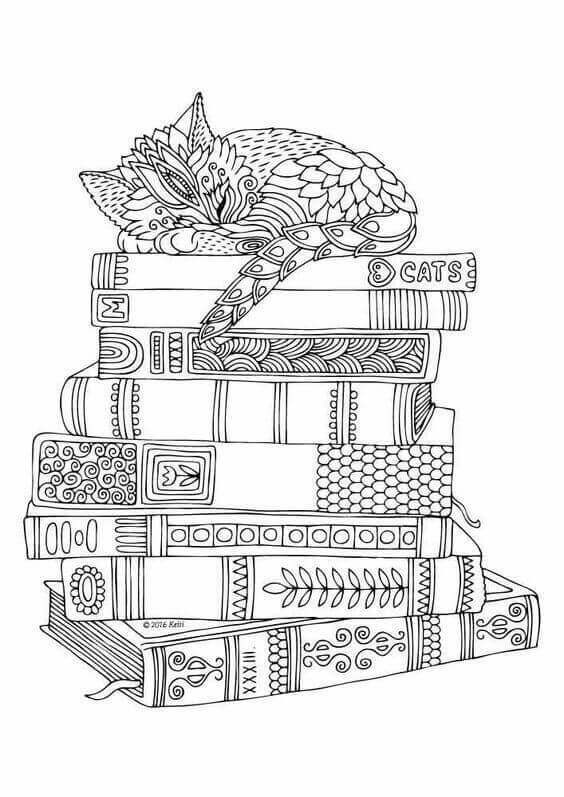 Take a break as coloring this can be incredibly relaxing! These sweet little kitties are Elsa and Hugh. The one with a bow is Elsa, and the other one is Hugh. Though they are siblings, they fight a lot, play-fight actually, but wait for milk together patiently, because they know that if they misbehave, they’ll not get their share of milk. 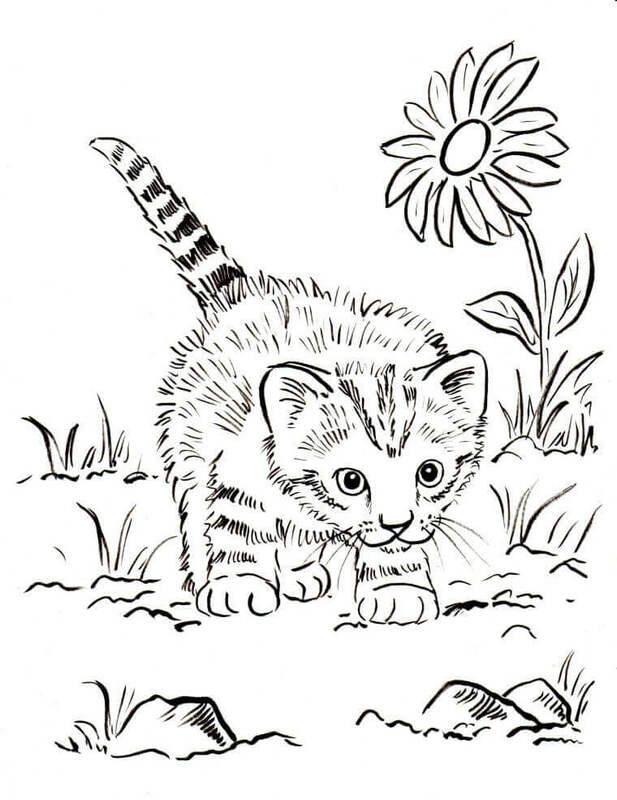 Kittens are very curious in nature, they get amazed and intimidated by everything. 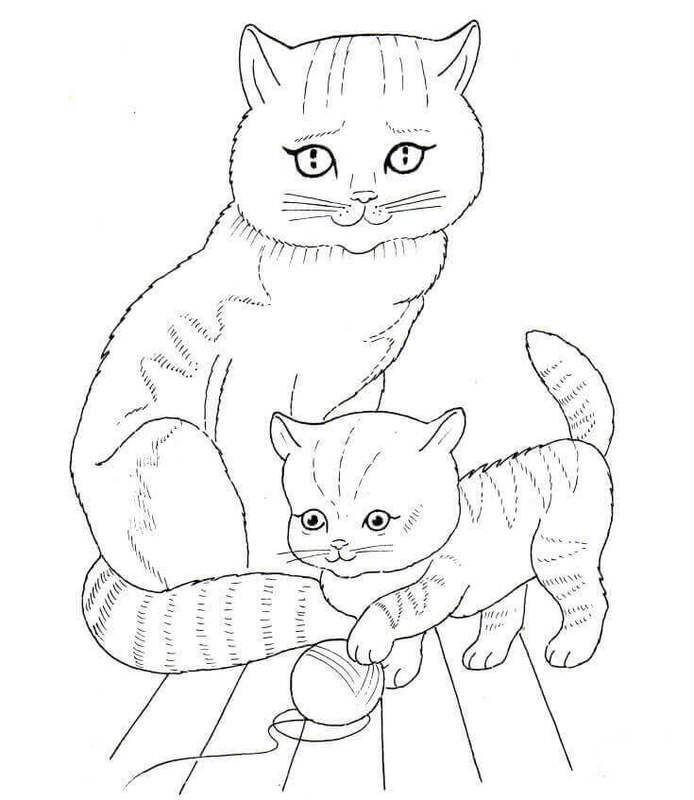 Here these two kittens perceive this dog toy as something new, something very different, hence one kitty is sitting on the top curious while the other is touching it to see if it is a threat. The look on their faces says it all. Isn’t it cute how tiny kittens are? They are so small that they can fit anywhere, anytime. 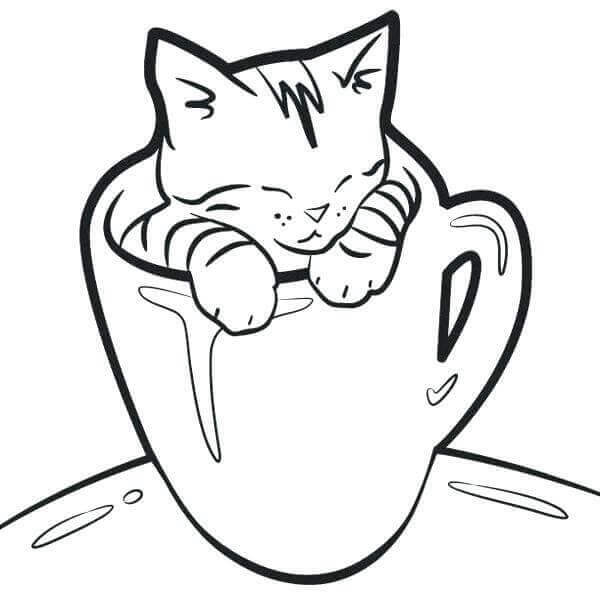 Just like this little kitty who is napping in this cup. She was enjoying playing in this cup right before she fell asleep. Maybe she is more comfortable in this cup than a soft bed that her master has bought for her. 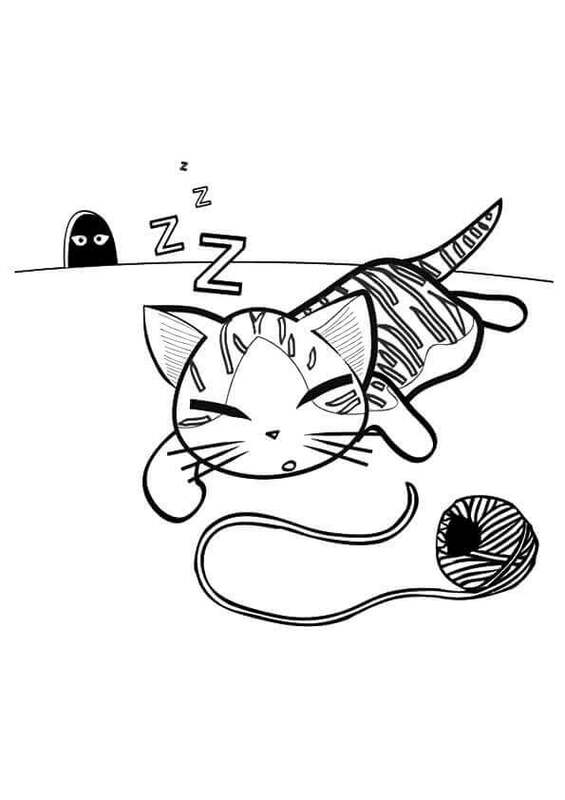 Ever wondered why a cat or kitten plays with a yarn? Well, there is not one explanation for this but many, one of them being the development of their hunting skills. Domestic cats are at a great disadvantage when it comes to honing their hunting skills. They have limited access to outdoor activities that limit their predator instincts. They are born hunters and thus, domestic cats turn towards yarn and wool balls to enhance their skills. Yes, their names are kept after “Frozen,” a Disney movie. In the movie, Elsa and Anna are shown as sisters who love each other a lot. Just like them, these little kitties love each other a lot as well. They eat together, sleep together, play together and what not! To distinguish between the two of them, their master has put a bow around them which makes them look incredibly cute. Color these two cute, little sisters. This juvenile cat is extremely happy to see this little insect. Her inquisitiveness has led her to this little ladybug who she hopes will become her friend. 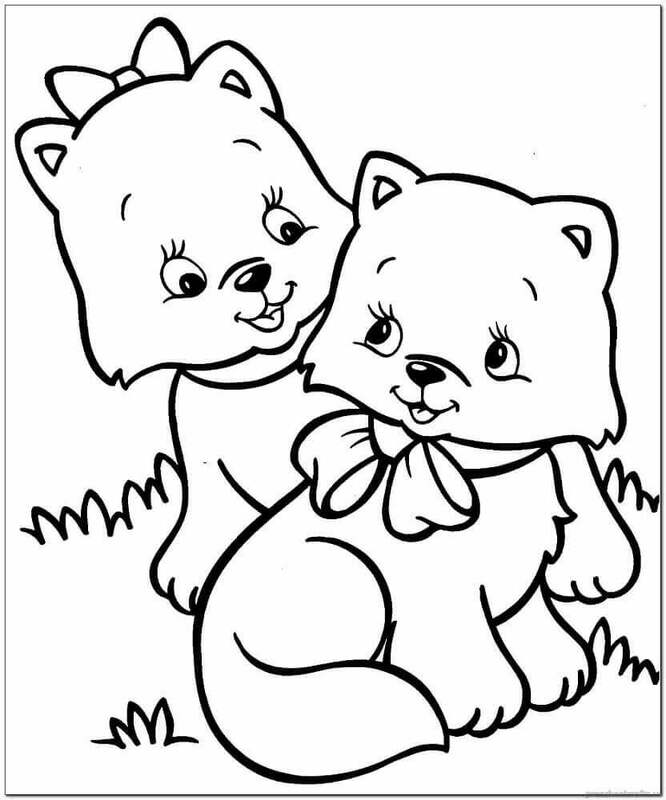 Color these two with beautiful hues so that they both become friends who look appealing. Sally this evening is making cookies for everyone because Dave says she is a good cook. This makes her very happy and encourages her to cook more. Her kitten, on the other hand, is just waiting for Sally to prepare the cookie dough, cut it with a cookie cutter and bake it so she gets to eat them as soon as she can. Sam and Tom are thought to be the most troublesome kittens out of all their siblings. They are always up to something which gets them into trouble. Like here, Sam is helping Tom to climb the wall which, if not done properly, can harm one or both of them. All cats can climb trees, unlike dogs. This little kitty is so playful that she has climbed the tree for fun. Like all the other cats, this playful little kitty has a strong back and hind legs that enable him to propel up a trunk and to perch on a sturdy branch. 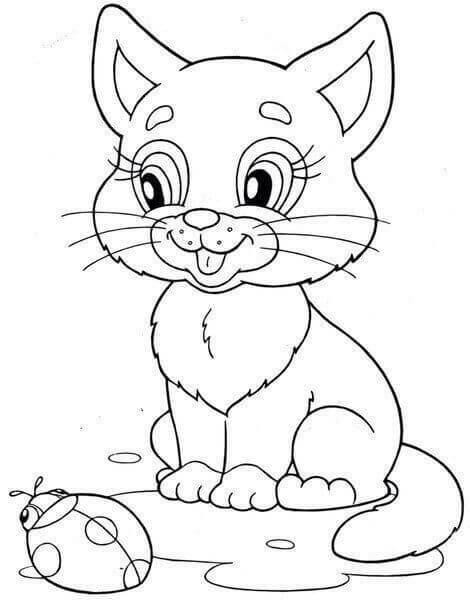 Let’s color this kitty! Poor Tim met with an accident for which he is being treated. It must’ve been painful. Unfortunately, he has injured his tail and neck while playing on the road and now he has to take this bitter medicine which the nurse is giving. This is the reason it is advised not to play on roads. You too can meet with an accident. Kittens look very cute, but at times they may look cunning. You don’t know what they’ll do next. Maybe they are planning mischief, or are feeling lazy. You never know! That’s why they are so mysterious and unpredictable. If you are planning to get a kitten, make sure it is not younger than eight weeks, and take it for vaccination at 2-3 months of age. The Siberian is a locally adapted variety of domestic cat present in Russia for centuries, and more recently developed as a formal breed. It is a natural breed of Siberia and also happens to be the national cat of Russia. Ed is playing with his new Siberian kitten which he got on his birthday and is extremely happy with it. Let’s color him happy! This is Tom. He dozed after playing all day with the yarn placed in front of him. Can you see those little eyes in the dark? Who do you think it is? If you guessed mouse, you are correct. He is keenly waiting to go into the kitchen and steal some cheese. Is this the right time for the mouse to enter into the kitchen? Kittens are so adorable and irresistible that no one can hate them. 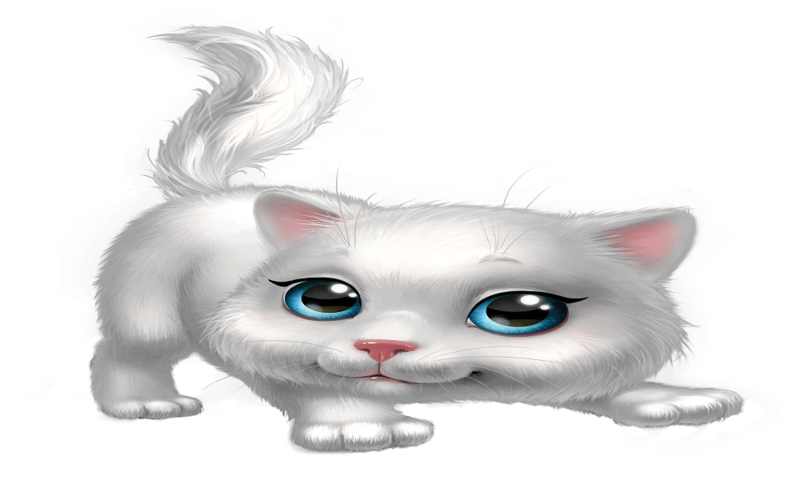 Everyone wants to have them as a pet and wants to hear their cute “meows”. There are a few interesting facts about these little creatures. Did you know a group of kittens is called “Kindle” and they grow up to become a “Clowder” of cats? There are 2 to 5 kittens in a litter. Remember, a kitten is for life, not just for Christmas. 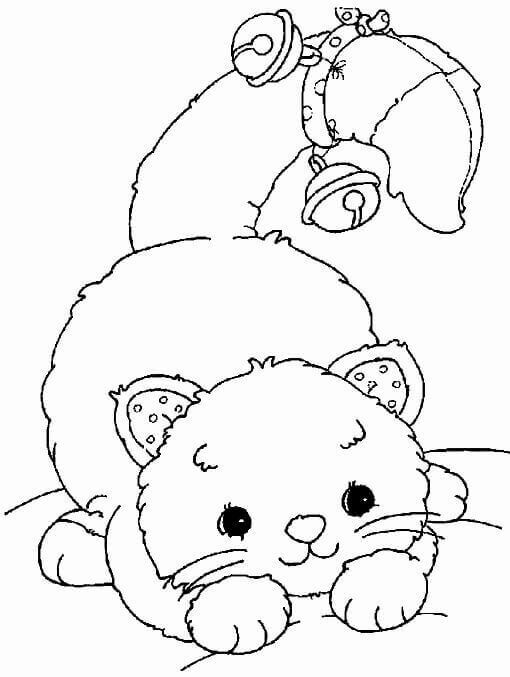 Hope you got to learn a few things, but for now, print and color these adorable kitten coloring pages printable with vivid hues!